What do the Royal Children Wear? Prince George wore an Amaia jumper for his first meeting with sister, Princess Charlotte. That’s pretty important stuff. Princess Charlotte has been spotted with hair accessories by the brand. Amaia was founded by mums Segolene and Amaia who moved from France and Spain respectively to London where they set up the brand. To date, Princess Charlotte and Prince George have worn this label 8 times. 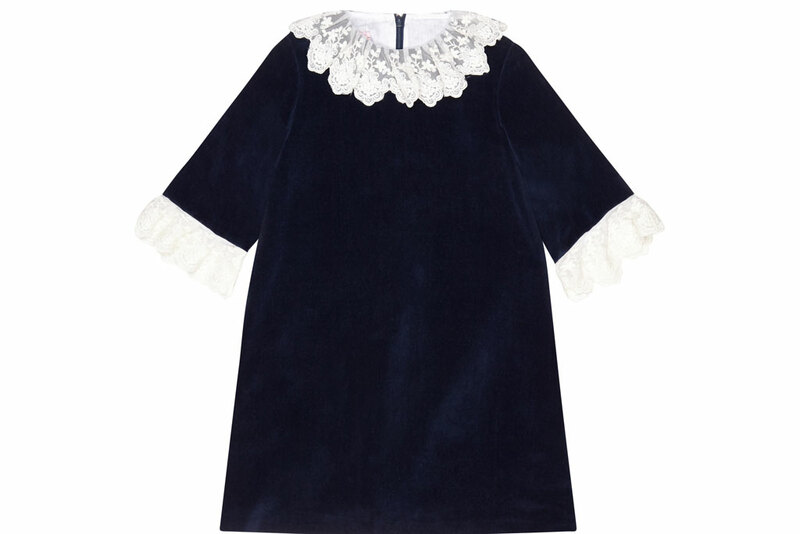 Princess Charlotte’s hand-smocked dress worn for a party in Canada was an instant sell-out item (see below). Like most of the Royals’ preferred brands, Pepa & Company offer beautiful classic styles. A young prince George was first introduced to the world swaddled in this super-fine merino wool Christening shawl by G.H.Hurt & Son. India and Maximilian, children of Andrea and Tatiana Casiraghi, chose to wear La Coqueta Kids for the celebration of the National Day of Monaco in 2018. The designs are sweet and great for party season, and the prices are incredibly reasonable for the quality provided. You may not be celebrating the National Day of Monaco with your royally cute kids, but we’re sure there’s an occasion for La Coqueta Kids somewhere this party season! Inspired by the 40s, 50s and 60s, Rachel Riley creates luxury children’s clothes in beautiful prints and classic styles. Prince George wore dungarees by the British designer for his first official engagement, a very important Plunket play date in New Zealand. The heritage collection includes adorable garments such as onesies and dungarees embossed with typical British figures, such as the guards on the cotton shortie above. Read our ‘At Home with Rachel Riley’ interview, here. Both Prince George and Princess Charlotte have been spotted in Doña Carmen pieces; the little Prince in red corduroy shorts and Princess Charlotte in shoes. Not only have Prince George and Princess Charlotte worn pieces by Les Petites Abeilles, but the owner and creative director is none other than Princess Désirée von Hohenlohe. The latest collaboration is with YOOX for an exclusive Summer Sports Capsule Collection. It features swimming, hiking, tennis and sailing dedicated looks. When meeting Barack Obama, Prince George was photographed wearing a blue gingham robe from My 1st Years causing it to sell out instantly. Being a royal and celebrity favourite, they may just be the number one personalised gifting brand for little ones out there. I mean, who doesn’t love a personalised gift? Princess Charlotte wore a cashmere cardigan on her first birthday. Olivier Baby is run by two sisters who hand-knit the samples and test the clothes on their five children (who often also feature in the brand’s campaigns) and the cashmere cardigans make for perfect presents. Luxury Spanish baby and toddler clothes in simple, classic designs. Princess Charlotte wore a dress by the brand for the Queen’s birthday photo. Another Spanish brand royals love. Prince George wore knitwear by Fina Ejerique for the Queen’s birthday photo. Read more about the brand’s co-founder here. The Royals have also been spotted in clothes from luxury West London kidswear retailer Trotters, which is run by husband and wife team Sophie Mirman and Richard Ross. Thought the royal children only wore designer kidswear brands? Think again. Prince George has been spotted in Cath Kidson, while Princess Amalia of Nassau wore Zara for her first released photograph. Infanta Sofía & Leonor of Spain often wear matching outfits from the likes of Mango Kids, while Isla Phillips has been spotted in Crocs and a Gap romper.